While we could tell you up and down all about our wedding services, we figured it might be best coming from one the brides herself. 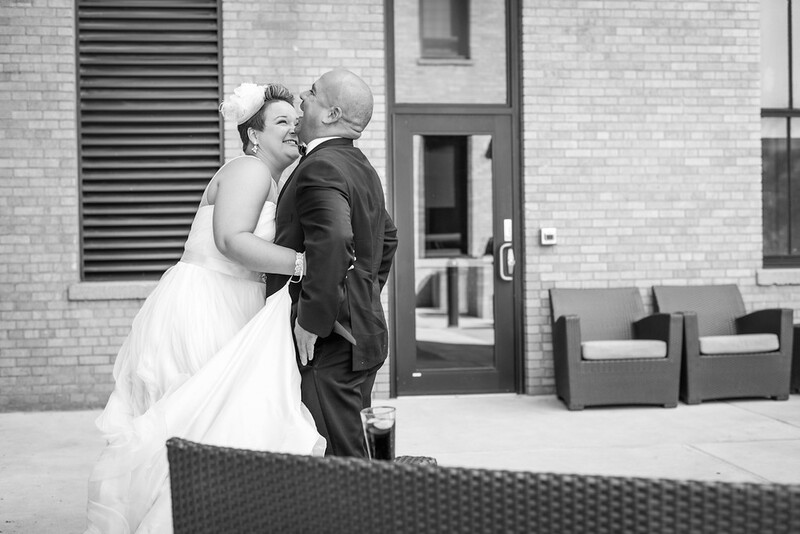 Omaha Musicians Live owner, Leah Lukowski, recently interviewed one our brides, Catrina Trabal, to get her perspective on the decision to incorporate live music into her wedding day. LL: What made you want to have live music over prerecorded music for your ceremony and cocktail hour? 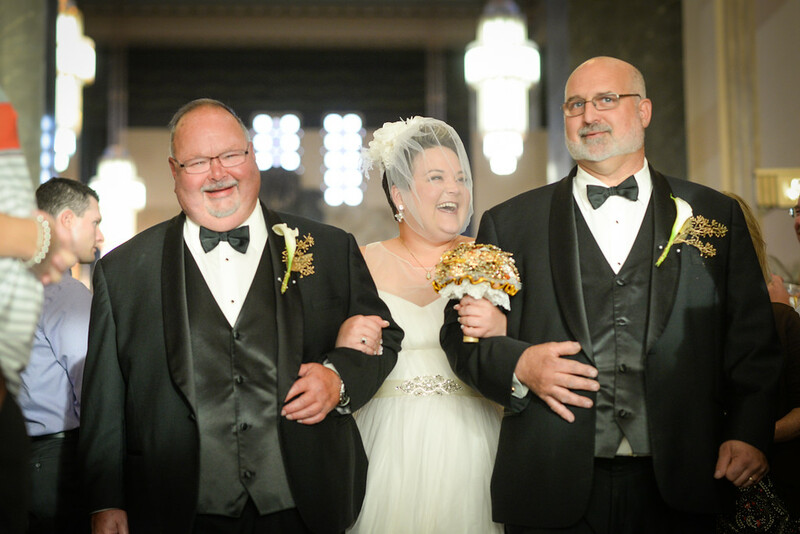 CT: When thinking about my wedding, I always imagined having a quartet. I felt it added a certain elegance. My fiancé and I went back and forth on it though, as we both loved the idea, but didn’t want our ceremony and cocktail hour to be stuffy. After seeing the available list of songs, however, we realized we could have the elegance of the quartet with modern songs to make it fun. LL: How did you select the genre of music for your ceremony/Cocktail hour? Was it easy or difficult? CT: We knew we wanted modern music that most people would know for the cocktail hour. I loved that during our reception and weeks after our wedding day, people came up to me to compliment the music selection, or ask “Did you know they played Bohemian Rhapsody by Queen? !” The music made for an awesome experience for everyone involved. As far as the ceremony, I selected about 10 songs that I knew and really enjoyed. From there, I listened for songs that flowed together, that fit and made sense in our ceremony. I also listened with my heart. In the end, our ceremony had the music that we connected with, that reminded me of my relationship with my husband. They were fun songs all centered on a beautiful, amazing love. I am passionate about music. I love that one song can bring back memories of a special time, or conjure up thoughts and feelings about love, friendship, etc. It was one of my favorite parts of all of the wedding planning. LL: Looking back was there anything you would have done differently regarding your music choice? CT: I would not have. I loved our choices! 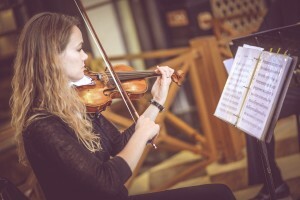 LL:When thinking about incorporating live music into your wedding day, is there any advice you would offer to future brides? CT: Listen to your gut. Go with what you know you want and what you will enjoy. If you stick true to yourself, you won’t go wrong. Everyone is there to celebrate your relationship, and they will celebrate in whatever fashion you want them to. Think of the tone you want to set. Our ceremony and reception were held at the Durham Museum in Omaha, Nebraska. We wanted to go with the elegance of the beautiful building, but honor our fun personalities and the joy of our day. Also, it is the bride’s special day. You should have everything you want. But don’t forget your groom. It is his special day as well. Select music and other things for the ceremony and reception that fits both of your personalities. LL: Based on your experience how likely would you be to recommend Omaha Musicians Live to other brides? CT: Hands down, you and your staff are the best, so incredible and so patient. We chose the quartet, and then we started second guessing. You helped me go back and forth with the pros and cons until we stuck with our decision. Also, at the ceremony, when we needed last minute assistance, you really stepped up to the plate to help. It meant so much as a bride in the midst of all the craziness, to have someone stay calm and assist. I wish I would have found Omaha Musicians Live sooner. We had gone to a bridal show and booked a D.J. very early in our engagement because of the deals and cheap pricing. Had I looked further into our options, I would have done all of my music through Omaha Musicians Live. Music really sets the tone throughout the night, and I feel we would have received better quality and more professionalism at our reception had we used Omaha Musicians Live. My husband and I can never say enough how happy we were with you and your services. We will always recommend them for music for any celebration. LL: Any additional comments you would like to add? CT: One of my favorite memories is during the ceremony, when my husband, step son, and I were doing the sand ceremony. The quartet played “To make you feel my love” by Adele. I specially requested this song, and thanks to Omaha Musicians Live and their wonderful musicians, the quartet was able to play it. It was a perfect song for the joining of our family. I still tear up thinking about it. I am forever grateful to Omaha Musicians Live for playing the soundtrack to my memories of a very special day. A huge THANK YOU to Catrina for her contribution to this blog post and also CONGRATS to Catrina and Milt, what a beautiful wedding! Over the past few years I have really noticed a shift in song selections brides are making for their ceremony. Just as they want to make the reception unique to them as a couple, they are now more than ever wanting to personalize their ceremony to mean more to them. In the past I think brides felt obligated to go with the musician and church music that was provided. It was easy and inexpensive, so it seemed like the right decision. Now, more and more brides are choosing to have their ceremony at the reception site, making it easier for their guests, and often times finding another way to cut costs. As wedding traditions will continue to change I have to make sure that we as a company continue to change as well. I can guarantee that most of you who have attended a wedding have heard the traditional wedding march, which most of us girls dreamed of walking down the isle to. But boy, the times they are a changin’. Most of the brides that we work with really want a unique ceremony, something different, and something to remember. 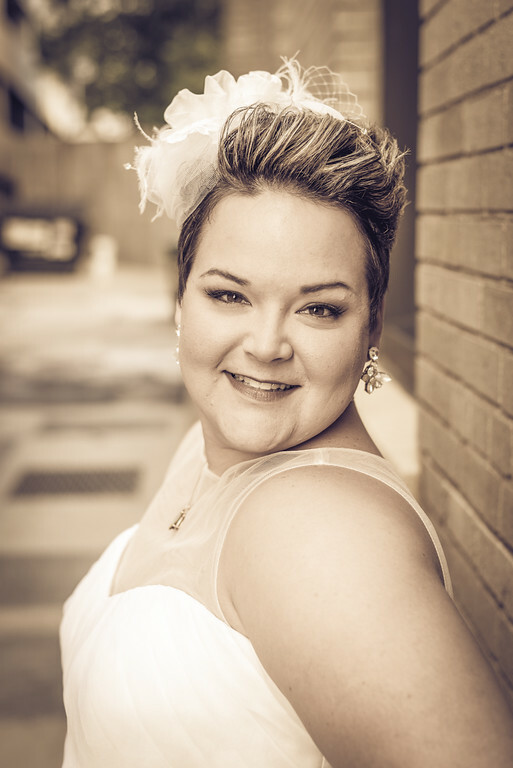 As I coach a lot of my brides to focus on the five main songs significant to their ceremony, I am often caught off guard at the song choices brides are wanting. By caught off guard, I simply mean, it is a song I never would have imagined for a wedding ceremony. But the truth is, it means something to our couples. And really that is all that matters. Our goal is to make sure our couples are excited about where there money is being spent and that they see the value in a live music. Sometimes I am nervous that I won’t be able to fill their request… but where there is a will there is a way. For those of you who are not familiar with the process, I have three options. Number one, I can possibly recommend a musician who already knows your song(s). Now sometimes I am not that lucky depending on the request. But I can try and fall on to option number two which is finding the sheet music. If I am dealing with a bride who wants a classical musician, often times, getting the sheet music isn’t a problem. But sometimes the sheet music isn’t written for the correct instrument. Then that leads me to option number 3… getting it arranged. Thank goodness for talented musicians because there are people out there who can listen to a song and write the sheet music for me or take a particular arrangement and write it for a different instrument. Now all of this is more costly…. but honestly, it’s not that bad. Now I wish I could list an exact price for a brand new song, but it really depends on what is needed. The great part is that I can usually get a couple a quote and then they can decide if they would like to spend the additional money. Have I been able to please every bride? Unfortunately not. Sometimes it is impossible to find the sheet music and they select a song performed by an entire symphony and want that performed by a soloist. 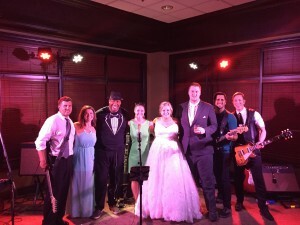 I understand that often times this is the first time our brides have hired live music and they need a little bit of help in understanding what is feasible with their budget. I am happy to work with them as well but after a little bit of explaining it makes a little more sense. There are also current artists, classical and top 40, who do not publish their sheet music and then again that can lead to complications. So truly, no matter how you want to make your ceremony unique, music is the way to do it. 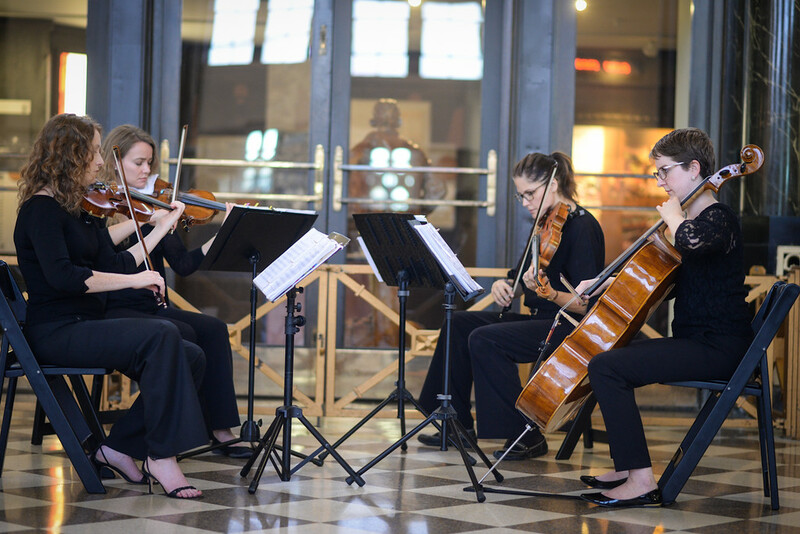 Whether you are wanting “Back in Black” by ACDC performed by a violin/cello duo, the theme song from the video game Zelda on harp/violin, or the theme song to Jurassic Park as you walk down the isle, most things are possible. (and yes these are all songs requests we have filled) And it’s okay to be different. It’s okay to ask for something a little outside the box. We as professionals are here to help you. You never know what is possible and you never know what can be done until you ask. 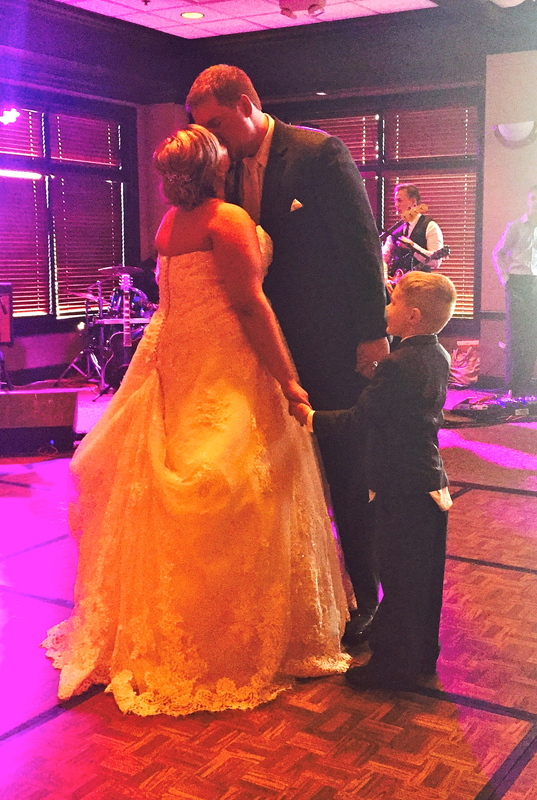 We LOVE our brides and grooms and this weekend was no different! We had the pleasure of working with Paige and Dan, planning their ceremony music and live music for their reception at Indian Creek. First of all, amazing job Indian Creek staff. They make everything so easy and really work with their couples to make the day wonderful! 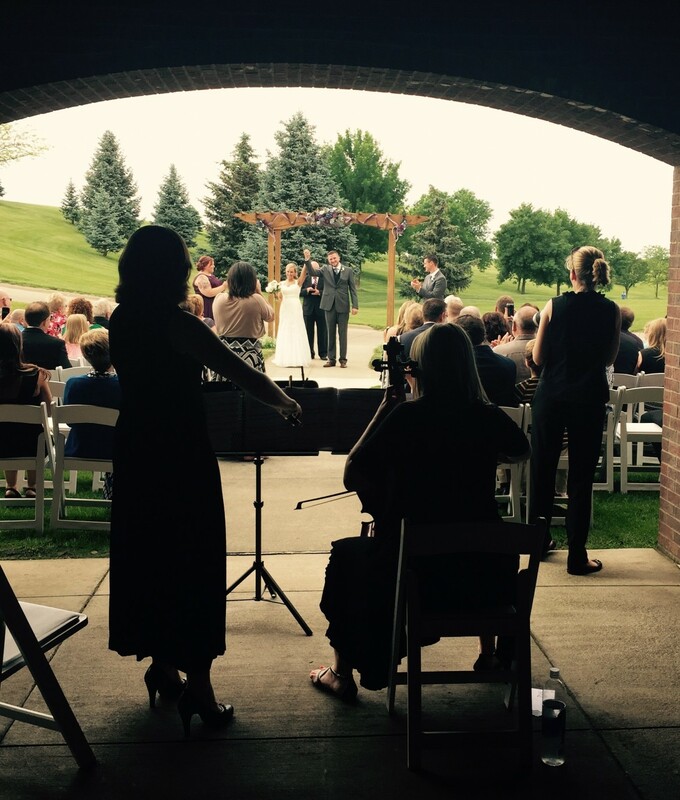 Paige and Dan chose a classical musician for their ceremony, and even though it was a hot day, everything went just perfect. The groom’s son walked down holding a sign that said “Daddy, here comes your bride” and it made everyone’s heart melt. The music continued as their guests made their way inside to a wonderfully air conditioned ballroom. The couple hosted a wonderful cocktail hour with drinks and hors d’oeuvres. This gave the wedding party time to enjoy a few drinks themselves and Paige and Dan to snap a few more family pictures. At about 6:30 we lined up the wedding party and got them ready for the grand entrance. All of the guests got a good laugh with the couple who chose to shot gun a beer for their entrance! All of formal events when off without a hitch and it was time for the wedding band to take over. We truly had such a wonderful evening watching everyone have a great time! The evening was filled with amazing moments which will be felt for a life time and I cannot express how much Rylee and I enjoyed working with this couple and getting to share in their day. Congratulations to the happy couple!!! Everyone here at Omaha Musicians Live wishes you a life time of happiness and thank you so much for trusting your music and entertainment to us! 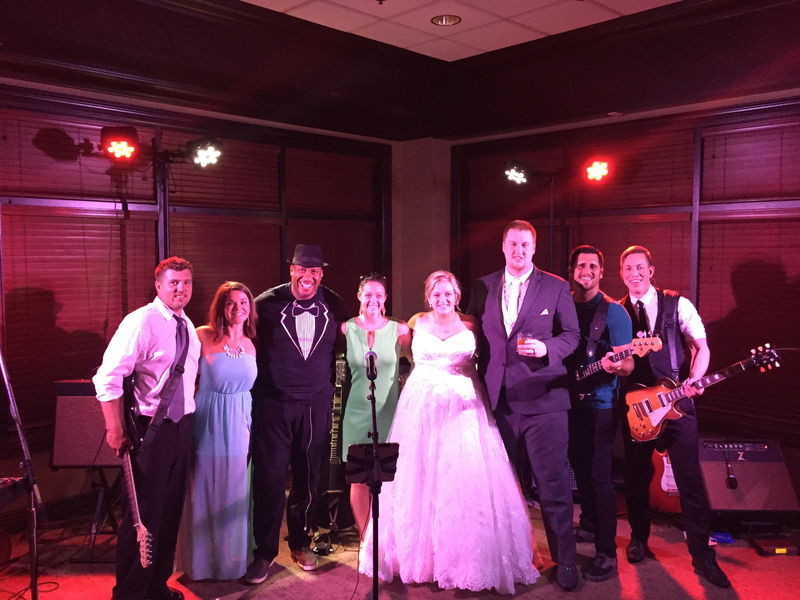 This weekend we had the pleasure of working with Jill and Kurt for their wedding music and entertainment. Their ceremony and reception were held at Indian Creek. We always enjoy working with Sue and her staff! 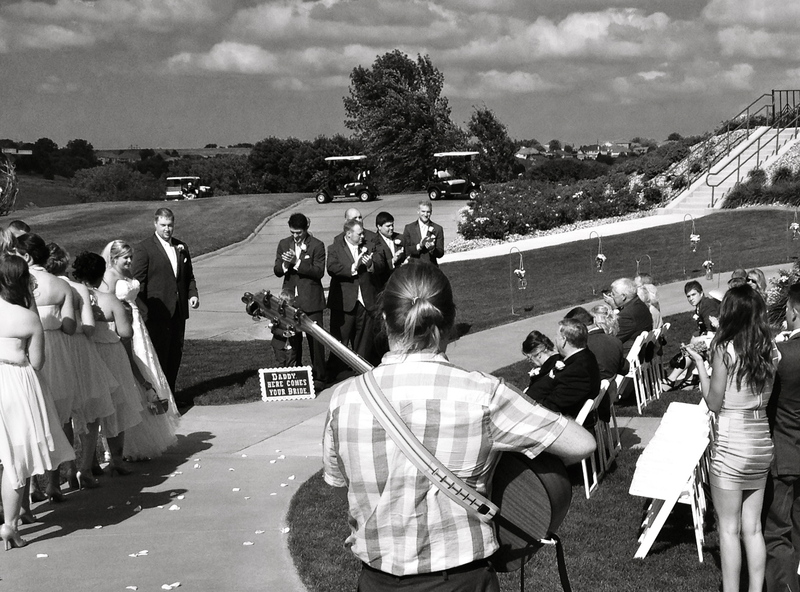 Jill and Kurt decided to go with a violin/cello duo for their ceremony music and it was absolutely beautiful. We placed them under the overhang and the music projected just perfectly for all guest to hear. The bride and groom selected an acoustic guitarist for their cocktail hour and dinner music. AJ did a beautiful job and we received several complements. The bride and groom had hired MAK Images for their photographer. Melissa, the lead photographer, had used images from the day and ceremony in a slide show during dinner. AJ played and sang along with the slide show and it just added to the beautiful atmosphere. The guests seemed to really enjoy it. One of the most special parts of the night was when Jill and Kurt had their first dance. AJ serenaded the couple with their favorite song, “Only You Can Love Me This Way” by Keith Urban. All I can say was that is was so beautiful to watch. Every time we work with a couple and have a live performer for their spotlight dances it truly makes my heart melt. 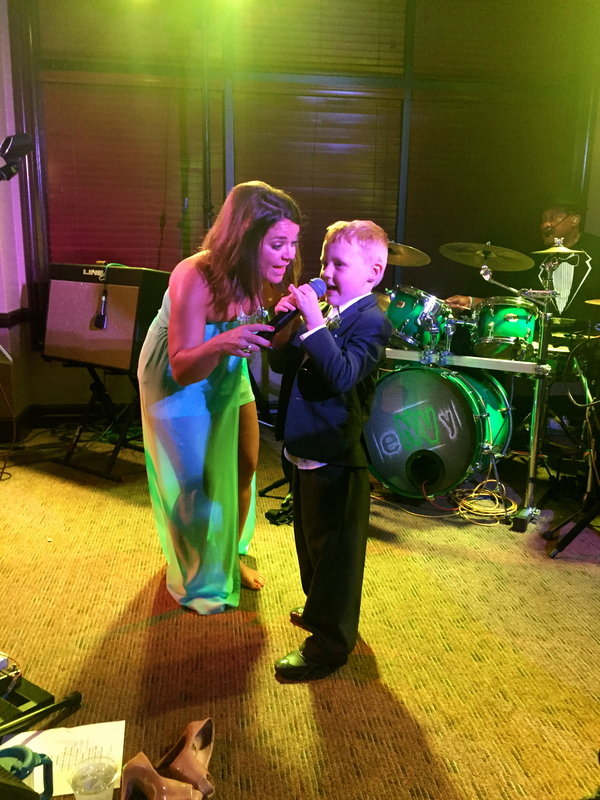 Although the couple was originally thinking they wanted a wedding band they eventually decided a DJ would be a better fit for them. DJ Conrad did a great job of handling the announcements and keeping the evening flowing. I was so grateful that everything went off with out a hitch for this couple!! Everyone at OML wishes you two the very best!